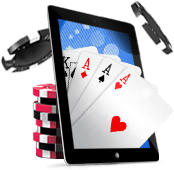 Do you want to quickly learn how to play casino games without getting bogged down by unnecessary details? We've put together the basic rules for six of the most popular casino favourites here on one page to allow you to quickly learn how to get started with each of these games. Look below for the game of your choice and brush up on the rules – we've even included summaries that cover only the most crucial aspects of each game. Good luck! 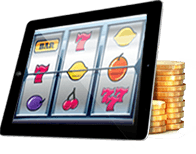 Pokies are the easiest games to play in the casino, and also the most numerous. This means that they're often the games that new or casual gamblers are most attracted to. When you first start playing on an online poker machine, you'll often get the choice to choose between several denominations (land-based pokies will normally have a single set denomination). This will determine the coin size for your game, and could range from a penny up to several dollars per coin. This, however, doesn't tell you how much it will cost to play each spin. While you can sometimes play a game for a single coin, you'll almost always have the option to bet more. Most pokies allow you to choose how many pay lines you will play (up to a set maximum); each "line" is a set pattern of symbol positions across the game's reels that gives you a chance to win. While you'll have to pay for each line separately, your chances to win will be scaling at the same rate. You may often also choose to play several coins on the same line; this will increase your winnings by that multiple if you score a win on that line. So, how do you figure out how much you're really spending on each spin? Simply multiply the coin size you're playing at by the number of lines and the number of coins per line. For example: if you're playing a penny slot, but also playing five coins each on 50 paylines, you're actually paying $2.50 on each spin. Once you've set your betting options, it's time to hit the spin button to set the reels in motion! In order to win prizes, you'll normally have to match identical symbols from left to right on the reels (some pokies have different rules which will be specified within the game). Different symbols offer varying prizes, usually ranging from some common symbols that frequently give out a handful of coins to rarer symbols that are related to the machine's theme and award big prizes. The more of the same symbol you match in a row, the bigger the prizes. Most modern poker machines utilize special symbols as well. A wild symbol is one that can substitute for any other symbol to help make a winning combination. A scatter symbol is one that can win prizes if you find a few anywhere on the screen, even if they aren't on the same payline. Additional bonus symbols may unlock special features or bonus rounds that can win you extra prizes or free spins on the machine. One special type of poker machine is the progressive jackpot game. On these machines, there's a jackpot that grows every time someone plays the machine and fails to win that jackpot. Over time, these jackpots can grow to enormous size; in the online casino world, some progressive jackpots have awarded millions of dollars to lucky winners! There's no real strategy to playing the pokies: you just spin the reels and hope to hit the lucky combination of symbols that will score you a win. That makes poker machines incredibly easy to play while also offering big prizes and fast action. The cost of pokies is determined by the coin size you choose, as well as the number of lines and coins per line that you choose to play. The object of the game is to match identical symbols from left to right across your active paylines. Special symbols like wilds and scatters can help you score even bigger wins. Progressive jackpot machines give you the chance to win massive prizes on a single lucky spin. Video poker machines may look like pokies, but they're actually an entirely different kind of game. While pokies are based almost entirely on luck, video poker is all about strategy and decision making. There are many different video poker machines, including popular titles like Jacks or Better, Joker Poker, and Deuces Wild. However, each of these follows some of the same basic rules, even if the payouts and strategies are quite different. When you first start playing a video poker machine, you'll need to choose to play anywhere from one to five coins per spin. It's generally advisable to play for the full five coins; on most machines, you'll get lesser returns on the jackpot hand (often a royal flush) should you play for less than five coins. Of course, not all winning hands are worth the same amount. In Jacks or Better, a winning pair will only get you back the money you put in the machine, while stronger hands will increasingly offer bigger rewards: two pair is worth two coins, three-of-a-kind is worth three, and so on up to a royal flush, which can earn you 800 coins. The exact payouts can vary between machines of the same type, as casinos can alter the pay table to create the expected return for players that they want. After winning hands, most machines will offer you the chance to play a gamble game. This allows you to guess whether the next card will be red or black for a chance to double your money. This is a fair bet between you and the casino, but it's also entirely optional – it's up to you to decide whether you want to risk your winnings or not. Players may play each hand for between one and five coins (five coins usually offering the best odds). Players are dealt a hand of five cards, from which they can choose to keep or discard as many as they want. Discarded cards are replaced with new cards from the deck to create the final hand. If the hand is good enough to meet the minimum requirements on the machine, the player wins, with bigger hands awarding larger prizes. Blackjack is a table game with worldwide popularity. It features fast action and a very low house edge, along with plenty of strategic decisions for players to make. It also has a number of variants, including some that are popular locally (like Pontoon), though we'll only be covering the main game of blackjack in this article. Blackjack is dealt from a shoe made up of a number of standard decks of playing cards, with shoes of six and eight decks being the most common. At the start of the hand, each player must make a bet. The players are then dealt two cards each face up, while the dealer takes one card face up and one face down (the hole card). In blackjack, the object is to make a hand that beats the dealer without going over a score of 21. Numbered cards are worth their number, face cards are worth ten, and aces are worth eleven unless this would cause you to go over 21, in which case they are worth only one point instead. The best hand possible is a blackjack – a starting hand of an ace and a ten-point card. 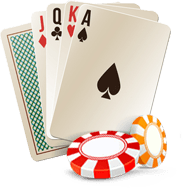 If the dealer has an ace, he will offer players insurance – a bet that protects the player's initial bet against the possibility of a dealer blackjack. For now, you should generally avoid this bet. The dealer will then check for blackjack; if they have one, all players lose (unless they also have a blackjack, in which case they push). If the dealer doesn't have a blackjack, all player blackjacks immediately win at 3-2 odds. Assuming no blackjacks, players must then choose how to play their hands. A player may choose to stand at any time, accepting no more cards and sticking with their current hand. The other common option is to hit, in which the dealer will give the player an additional card for their hand. On the first two cards, a player may also choose to double down – placing a second bet in exchange for one more card, after which they must stand – or split a hand containing two cards of the same rank into two separate hands, each of which will be played for one bet. A player stops playing their hand either when they choose to stand or their hand goes over 21 points. If that occurs, the player is said to have busted, at which point they immediately lose their bet. After all players have played their hands, it becomes the dealer's turn to play their hand. They will reveal their hole card, and then choose to hit or stand based on rules that are printed right on the table. One common rule set requires the dealer to hit on any hand of up to 16, while standing on 17 or above. If the dealer busts, all players still in the hand win even money on their bets. If the dealer stands, all players with hands that beat the dealer win even money, while those that lose to the dealer lose their bets. If the player and the dealer tie, bets on that hand are considered a push. The object of the game is to have a higher value hand than the dealer without going over a score of 21. Face cards are worth ten points, numbered cards are worth their printed number, and aces are worth either 11 or one, depending on what most benefits your hand. The best possible hand is a blackjack – a 21-point hand of an ace and a ten-point card. Players may choose to take as many cards as they like (hit) until they choose to stop (stand). If a player goes over 21 points, they "bust" and lose all best on that hand. If the dealer busts, all players who are still in the hand win immediately. 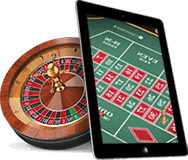 Roulette is perhaps the most famous casino game in the world, with almost everyone recognizing the roulette wheel as a gambling symbol. It's a very easy game to play that anyone can jump into in just moments. Roulette is played by having a croupier (or dealer) spin a ball around the outside of a large wheel. The ball will eventually slow down and fall into one of many numbered pockets. That determines the winning number, and bets that included that number are paid while all others lose. There are two forms of roulette: European roulette (which is more common in New Zealand and Australia), in which the wheel contains the numbers 1-36 along with a zero, and American roulette, which also adds a "double zero" (00). It's worth knowing that the European version of the game is considered the better game for players, as there is a much lower house edge. Before each spin, players have the option of placing a wide range of bets on the roulette layout. For instance, you can simply place your chips on top of a number; if that number wins, you'll win at odds of 35-1. Placing your chips on the intersection of two numbers will win if either of those two numbers wins, paying 17-1. Don't worry too much about strategy; in most cases, all of these bets have exactly the same house edge, so it's entirely a matter of personal preference what you bet on. The bets we described above are known as "inside bets." There are also "outside bets" that can be wagered on, so named because they're located on the outside of the roulette layout. These include betting on whether the winning number will be odd or even, whether the winning pocket will be red or black, or which column the winning number will appear in. These bets cover more numbers, but pay out at lower odds than the inside bets (even money for most of the bets we described, and 2-1 for the "columns" bet). If you're playing online, you can set the pace of play by telling the game when to spin the wheel; in a live casino, the croupier will let you know when no more bets are allowed. After each spin, the winning number will be marked, the losing bets will be taken off the table, and the winning bets will be paid. After that's completed, you can once again place bets on the next spin. Roulette is played by spinning a ball into a large wheel with many numbered pockets. The object is to place bets that accurately predict which pocket the ball will fall into. Bets range from those that cover a single number only to those that cover nearly half of the possible outcomes, with bets that cover fewer numbers paying out at higher odds. European roulette has 37 pockets on the wheel, while American roulette has 38 pockets. Since both games pay out at the same odds, European roulette is the better game for players. Craps is a game that many new gamblers stay away from because of the intimidating layout of the game. There's money, chips and dice going around the table at a rapid pace, making it seem like way too much to handle. But in reality, anyone can understand the basics of the game very quickly and worry about figuring out the finer points of the other bets later. 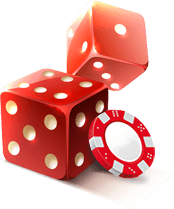 In craps, each game is started by selecting a shooter – a player who will throw the dice (in online craps, you'll always have this role) – to roll two dice on the table. This roll is known as the come out roll, and is the basic entry point to the important bets in craps. On the come out roll, most players will choose to make the pass line bet. This bet wins even money if the come out roll is a 7 or 11, and loses if that roll is a 2, 3, or 12. On any other result, the number that is rolled becomes "the point." If a point is determined, the pass line bet will now win if the point is rolled a second time before the shooter rolls a seven. If that occurs, the pass line bet again wins even money; if not, the bet loses when a seven is rolled. After a point is determined, players who made pass line bets have the option to "take the odds." This is a bet that can be made behind your initial bet that will also win if the point is rolled before a seven. Even better, this bet pays out at higher than even money – in fact, the odds are tailored to be completely fair between the player and the casino on this bet. This bet pays 2-1 if the point is 4 or 10, 3-2 if the point is 5 or 9, and 6-5 if the point is 6 or 8. The above is all you really need to begin playing craps! While there are dozens of other bets available on the table, those aren't necessary to the enjoyment of the game. If you do want to branch out a bit, you might try betting on "don't pass" – a bet that basically has you rooting for the opposite of what you want from a pass line bet, and also allows you to "lay the odds" after a point is determined (this time hoping for a seven instead of the point). The first roll of a craps game is known as the "come out roll." The most basic bet in craps is the pass line bet. This bet wins if the come out roll is a 7 or 11, and loses on a 2, 3 or 12. If any other number is rolled, that number becomes the point. The pass line bet now wins if the point is rolled before a seven. When a point is determined, you may also "take the odds" behind your pass line bet. This bet offers odds that are designed to be completely fair to both sides, with no house or player edge. An alternative to the above bets is the "don't pass" bet, in which case you'll be rooting for the opposite of the above results in order to win. Bacarrat is a game that's most popular amongst high rollers and Asian players, but that often gives new gamblers the impression that it must be difficult or confusing to play. In reality, baccarat is a very easy game to play with only a few rules that you need to know in order to get started. 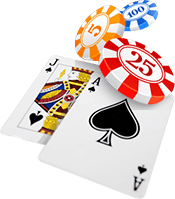 Baccarat, like blackjack, is a game played using a shoe made up of several decks. In this game, however, the dealer controls all of the cards and hands throughout the game. There are two hands – the banker hand and the player hand – but those names are only colloquial, since the dealer does all the work for each. At the start of each hand, the player may bet on either the banker or dealer hand to win, or bet on a tie between the two hands. After the bets are made, the dealer will deal out two cards each to the player and banker hands. Hands are scored based on the value of the cards in them: tens and face cards are worth zero, aces are worth one point, and numbered cards are worth their number. Only the last digit of the score matters, so a hand of 10 is actually worth zero points, and a hand of 15 would be worth five. If either hand has a score of eight or nine, the hand immediately ends. If not, the player hand will take an additional card if their hand total is five or less; otherwise, they will stand. If the player hand stands, the banker will hit with five or less, and stand otherwise. If the player hits, the banker hand chooses to hit or stand based on a rules chart that the dealer will follow. Once all cards have been dealt, the hand with the higher score wins. Bets on that hand win, while bets on the other hand or a tie will lose. Bets on the player hand pay even money when they win, while winning banker bets pay even money minus a 5% commission. In the case of a tie, bets on either the player or the banker push, and tie bets win at odds of 8-1 or 9-1, depending on the casino. The best bet for the players is the banker bet, while the player bet is also considered a good bet. However, the tie bet has a much higher house edge, and should be avoided by smart players. Baccarat is a game in which the dealer deals out cards to two competing hands: the "player" and the "banker." Players may bet on either hand, or on a tie. In each hand, aces are worth one, numbered cards are worth their number, and tens and aces are worth zero. Only the last digit of each hand's score matters (so 1, 11 and 21 are all equivalent to a score of 1). The dealer will give cards to each hand based on predetermined rules. Winning bets on the banker or player pay even money (minus a 5% commission on banker bets), while winning tie bets normally pay 8-1.